Nearly 950 wineries call the Evergreen State home. 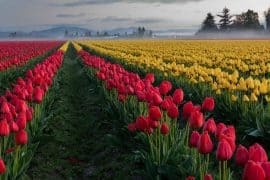 From the Puget Sound to Lake Chelan to Yakima Valley, Walla Walla Valley and the Columbia Gorge, Washington is prime for a circular road trip to fourteen American Viticultural Areas. From maritime to mountains and desert to Missoula Floods remnants, there is adventure, vistas, history and romance to be uncorked in nearly every barrel and bottle. Follow along as we share some must-see wine spots and experiences that elevate wine tasting to wine travel. Ease into island time on the short ferry ride from West Seattle to Vashon Island. Vashon Winery has been crafting boutique wines for more than thirty years and it’s one of the few places in the Northwest producing wine from Chasselas Doré, a white grape that hails from Switzerland mountain ranges. If Vashon is boutique, Maury Island Winery is nano, but, as they say, great things come in small packages. These estate-grown wines emphasize sense of place with Puget Sound pinot noir and pinot gris. To round out the three-winery Vashon Island tour, check out Palouse Winery. Its 2017 “Pearlescent” cabernet franc rosé is a quintessential island wine, pairing seamlessly with seafood and light salads. At just 9 square miles in size, Lummi Island rewards visitors with one of the finest dining experiences in the Northwest at The Willows Inn. A scant five-minute ferry ride from Bellingham, its forage-driven menu—headed by acclaimed chef Blaine Wetzel—and mesmerizing water views are the perfect accompaniment to a curated wine list with a strong Washington selection. Make it an overnight at this circa 1912 inn so you can partake in a pampering breakfast. 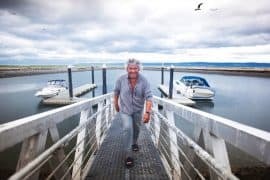 If you find yourself in Bellingham in the summer, be sure to book an unWINEd on the Bay wine- tasting cruise. Since 2012, San Juan Cruises has offered this scenic and educational experience that showcases a different wine region from around the world every Thursday evening. Photos ops of Bellingham Bay are a bonus. The Bavarian town of Leavenworth supports a healthy selection of tasting rooms along its main drag, but a short drive out of town affords its own surprises. Located completely o the power grid, Boudreaux Cellars highlights amazing mountain views deep in the idyllic Cascade Mountains, and the 200-barrel cellar takes advantage of consistent temperatures found only underground. Icicle Ridge Winery has two tasting rooms in town but, for guided wine hikes that end with lunch and a wine pairing, venture out to its 5,000 square-foot log home winery. Established as an AVA in 2009, Lake Chelan already counts more than thirty wineries, the majority of which surround its picturesque lake. The perfect way to take in all this lush scenery is a Lake Chelan Wine Valley tour aboard Lake Chelan Helicopters. Six separate wineries can accommodate a helicopter landing, including Rio Vista Wines, which hosts a summer concert series, and Tsillan Cellars, an Italian-themed winery complete with 80,000 pounds of Italian marble stone and on-site Sorrento’s Ristorante. Focused on sparkling wine, KARMA Vineyards and its underground wine cave is a not-to-be-missed stop while in Chelan. With its estate grapes, KARMA invests in the traditional French method of creating sparkling wine and fashions a brut, brut de brut and a rosé style. Stone, rock, exposed beams, slate and hardwood are the materials used to create a menu of overnight accommodations at Cave B Inn & Spa Resort. A working farm that affords panoramic Columbia River views from its basalt cliff location, Cave B Estate Winery is one of the many on-site treats here. Drawing from more than 100 acres under vine, Cave B is part of the Ancient Lakes AVA. In the main lodge, Tendrils Restaurant thoughtfully pairs estate wines with locally focused cuisine. Better known as the hops-growing capital of the U.S., Yakima Valley was the first AVA in Washington. Unique wine experiences and some of the highest-rated wines in Washington’s winemaking history can be found here. Care to follow up a little rock climbing with wine tasting? Wilridge Vineyard is a recreational vineyard where guests can picnic, enjoy scheduled yoga, and also rappel from Andesite rock cliffs and hike, bike or horseback ride Cowiche Canyon’s Upland Trails. Continuing the horse theme, Cherry Wood Bed Breakfast & Barn in Zillah o ers hay wagon winery tours. By night, Cherry Wood is a glamper’s dream with decked out teepees and open-air soaking tubs, but a day of traipsing around four wineries in their “cowboy limo” is the plush life. If you’re looking for views for days, Col Solare is the spot. Built on Red Mountain, guests relish views of the Yakima River, Col Solare’s fan-shaped vineyard and Mount Adams and the Horse Heaven Hills in the distance. Symmetry and beauty are found in the wines and mimicked in the architectural details. In Prosser, Walter Clore Wine & Culinary Center aims to take visitors on a trip through Yakima Valley wine country in one stop. 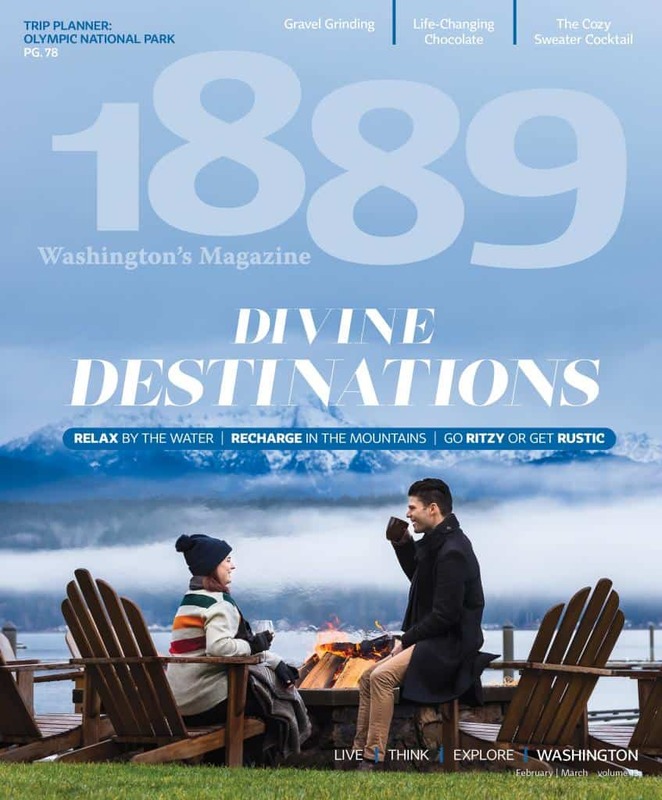 Highlights include views of the Yakima River, a different Washington AVA featured on the center’s tasting room lineup each month, a wine-driven small bites menu and a host of regularly scheduled tasting events. Walla Walla’s Abeja Winery is situated on 38 acres of gardens, lawns, creeks and vineyards. Its inn is anchored by a stunning, turn-of-the-century farmstead where original outbuildings have been restored to luxurious guest accommodations. 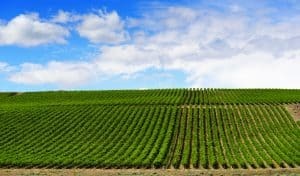 is appointment-only winery is steeped in dramatic history and capped o by some of the most premium wines in Washington. Long Shadows Vintners and Foundry Vineyards have two things in common— beautifully crafted wines and thought-provoking art. The modern tasting room of Long Shadows displays Chihuly glass sculptures, and wines are a collective of ve internationally acclaimed vintners. Choose from a 60-minute Portfolio Tasting or 90-minute Inside Story Tasting, both by reservation only. Also an art gallery, Foundry Vineyards holds tastings in a sleek space surrounded by rotating fine art pieces. Visitors are encouraged to bring picnics and unwind in the outdoor sculpture garden. Set in a circa 1915 schoolhouse, L’Ecole No 41 is simultaneously a unique tasting experience and story. For a deep dive, sign up for a Reserve Tour and Tasting, where guests are immersed in the history of L’Ecole through words, a walking tour and library wines. If tiny-house living is calling your name, Alexandria Nicole Cellars at Destiny Ridge has four where guests can overnight. For example, Jet Black is a blend of New York art gallery and Northwest upcycling complete with a repurposed fermentation tank that dispenses your choice of red or white wine from convenient kegs, a roll-up garage door that adds outdoor square footage and a bedroom oriented to greet the day with vineyard and Columbia Gorge views. Less than two hours west from Paterson is Underwood Mountain, where Hawkins Cellars takes full advantage of its hard-fought location with more dazzling Gorge views and Mount Hood in the distance. 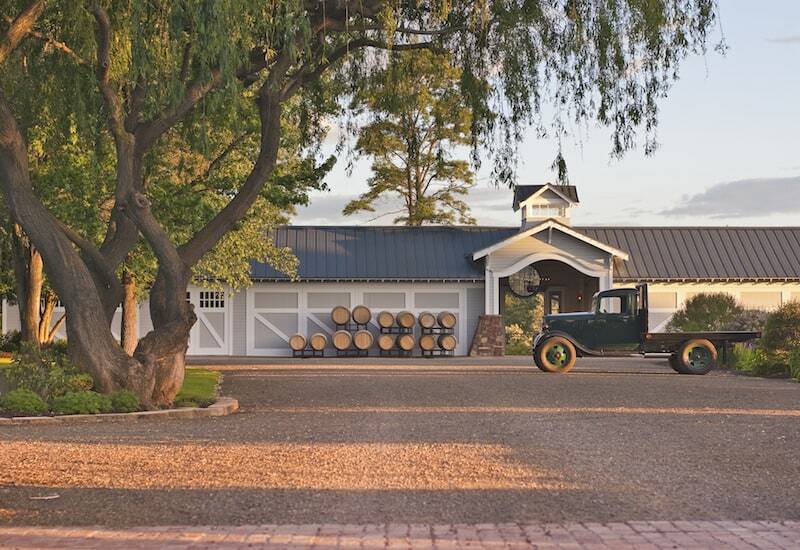 Croquet and bocce ball encourage guests to linger and hear the story of how winemaker Thane Hawkins made the move from animation to fermentation. Skamania Lodge is celebrating its twenty-fifth anniversary throughout 2018. An emphasis on Columbia Gorge wines is the sip du jour as guests look over the breathtaking National Scenic Area. Skamania also o ers a selection of wines in the on-site Waterleaf Spa and wine-infused lotions, scrubs and massage oils for spa treatments. Take in views of the long-awaited Grant Street Pier, casting its nautical silhouette 90 feet out over the Columbia River, while swirling a glass of Alexandria Nicole Bohemian Blend or Terra Blanca cabernet sauvignon at WildFin American Grill. 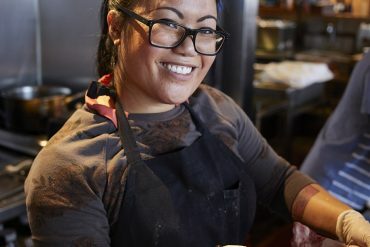 Located in the new Waterfront Vancouver development, this locavore- centric eatery boasts a “barrel to bar” program featuring Washington wines on tap. 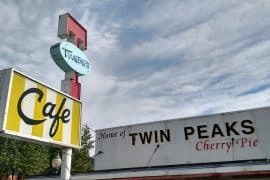 Twenty minutes up I-5, it’s time for a sweet treat. Gary Gougér, winemaker at Gougér Cellars, has figured out how to remove the alcohol from his wines and, with no added sugar, crafts such tempting flavors of wine ice cream as zinfandel chocolate chip, muscat with lemon lime zest, muscat with toasted coconut and muscat with berries. A collaboration between Chelatchie Prairie Railroad and Moulton Falls Winery, the Wine Train runs down the tracks from May through November. Purchase train tickets and wine at Moulton Falls, board the 1929 steam locomotive and enjoy a 7-mile excursion as it passes through a 330-foot solid rock tunnel. Rockstar winemaker Charles Smith fashioned Charles Smith Wines Jet City from a defunct Dr. Pepper bottling plant. Located in the Georgetown neighborhood of Seattle, this extraordinary setting takes advantage of Boeing Field runways and nearby mountainscapes. The two tasting rooms are a real mix, with rustic Northwest representing downstairs and Austin Powers-meets-James Bond happening upstairs. In the heart of downtown Seattle, wine lovers find their happy place at Purple Café and Wine Bar. Tours are given of the floor-to-ceiling “wine tower” which captivates first-time and returning guests. A team of sommeliers stands at the ready to help patrons with a wine list longer than 100 pages. With more than 100 wineries comprising Woodinville wine country, Bramble Bump at JM Cellars is an oasis. This 7-acre arboretum o ers a trail system with more than 400 conifers and 200 Japanese maples, while a rock garden, bocce court, outdoor re pits and multiple patios accent the grounds. Massive custom copper doors lead to the wine library and barrel room where guests can attend a private wine blending with owner and winemaker John Bigelow. In recent years, wine country has done a great job promoting the idea of “Wine and…” Check out this abbreviated list designed to keep you imbibing and exploring. Here are more recommendations for top stops along the diverse landscape of Washington wine country. Hedges Family Estate: A French-style chateau in the middle of Red Mountain with a must-see champagne room. Prosser’s Vintner’s Village: Nine wineries, one tasting room and one wine bar comprise this walkable wine-driven development. Yakima Valley Visitor Information Center: Visitors can purchase Yakima Valley wine, beer and cider and sample a rotating array of local wines. Columbia Gardens Wine Village: At the confluence of the Columbia, Snake and Yakima rivers sits the Port of Kennewick and its newest venture. Bartholomew Winery and Palencia Wine Company are the first tenants in this boutique winery concept. Sleight of Hand Cellars: A fun, music-centric tasting room with vinyl spinning in the background. Pepper Bridge Winery: A food & wine pairing class, complete with a chef-led tasting of small dishes. Northstar Winery: Offering a blending experience capped off with a custom label. Novelty Hill-Januik: An ultra-modern winery with floor-to-ceiling windows that overlook barrel and fermentation tanks. Chateau Ste Michelle: The newly remodeled visitor’s center offers multiple guest experiences and is ideal for picnics on the lawn. Two Vintners: This industrial winery is a hit with parents because of the playroom behind the tasting room’s curtain.